IPB has a long history of struggle. Started from the University of Indonesia in Bogor, the university became the forerunner of the first agricultural higher education in the country in 1940. Furthermore, based on the Decree of the Minister of Higher Education and Science No. 91/1963 and ratified by Presidential Decree of the Republic of Indonesia No. 279/1965 on 1 September 1963, IPB secede from its parent university to become the Agricultural Institute in Bogor. At this time IPB is the only college in Indonesia that bears the name of "institute" same level as university that given full trust by the government to pursue and develop tropical agricultural sciences in the country. Since 53 years ago, IPB has grown and developed into a college that has a good reputation and plays an important role in the national development and higher education in Indonesia. IPB’s growth and development has gone through three periods of time: the colonial era, the period of struggle for independence, and the period after the proclamation of independence. In the three period there was a consistent thread that consists of the striving, nationality, patriotism and leadership of the predecessors. These are the values that have always been held firmly from time to time. The tradition of community service, which is an integral part of the higher education’s Tridarma (three main responsibilities), was also born from this campus. The action research that began in 1963 in Karawang and in cooperation with various universities and other institutions has led the Indonesia nation to significantly increase rice production and even achieve self-sufficiency in rice. IPB also always upholds the principle of providing wide access to high quality education. IPB has a new student admission system through invitations to high-achieving high schools to propose the best students to become the students of IPB. The selection, which is based on their academic records, is the concept of IPB developed since 1976 with the principle of providing access as much as possible. In 2011, such a selection was then elevated or adopted into the national system in the new student admissions by State Universities (PTN) throughout Indonesia. Meanwhile, IPB’s strength in the establishment of general competence turns out to have led the students to become graduates who are ready to play a role in many areas of life. The values that can be learned from a wide range of teaching and learning in IPB are familiarity of managing complexity and uncertainty, excellence in numerical and scalable solutions, always thinking of systems and caring for the environment, always thinking and acting systematically, complying to the regulations, and always caring for farmers as well as readily helping others. 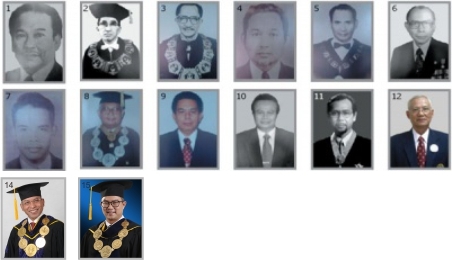 Now at the age of 53 years, IPB has nine faculties: the Faculty of Agriculture, Faculty of Veterinary Medicine, Faculty of Fisheries and Marine Sciences, Faculty of Animal Science, Faculty of Forestry, Faculty of Agriculture, Faculty of Mathematics and Natural Sciences, Faculty of Economics and Management, Faculty of Human Ecology, Business School, Graduate School and Vocational School. IPB currently has 36 departments, 21 Study Centers, 159 undergraduate and graduate programs and 18 diploma (vocational) educational programs. And until January 2016, IPB has graduated 133,778 students. On September 1, 2003 IPB reached the age of 40 years. Historical development of IPB starts from the embryonic phase (1941-1963), birth and growth phase (1963-1975), maturation phase (1975-2000), autonomy implementation phase (2000-2005) and leading to the State Owned Legal Entity-based IPB phase (BHMN) commencing in 2006. In 2007 it is expected that IPB is ready conceptually to become a research-based university.